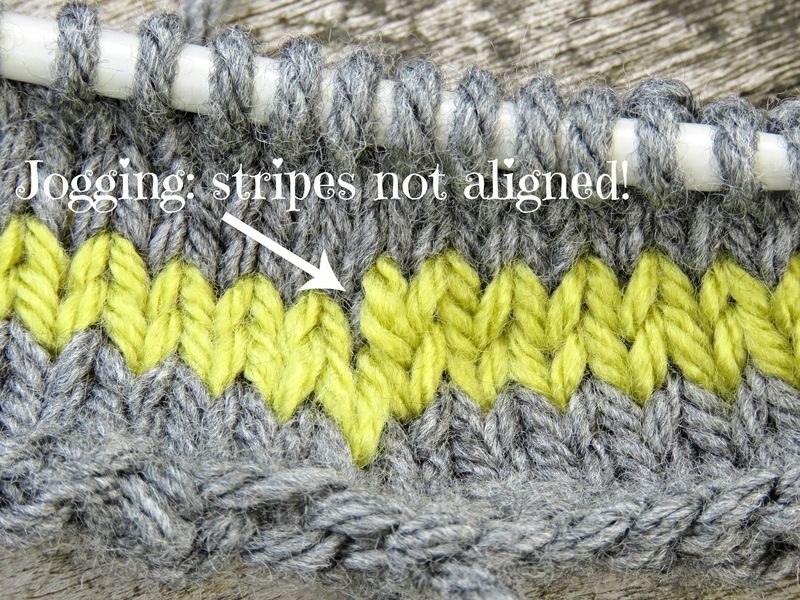 Have you found when you're knitting in the round that it's almost impossible to get your stripes to match up perfectly? I think the technical term for the problem is jogging. The stripes tend to jog on a little on their own, so that they never perfectly encircle the work. At the root of the problem is the fact that knitting in the round is really knitting in a spiral. You don't stop and join the first to the last stitch at the end of a row. No, you carry on, slipping effortlessly up onto the next row. It's a spiral that you're making, not a series of perfect circles. This is all fine and dandy if you're knitting with one colour, but it is irksome if you're trying to do neat, clean stripes with a beginning and an end that meet tidily. Perfectly joined stripes never happen naturally, and it's impossible to make the issue disappear completely, but there are a couple of things you can do to mask the problem. 1. 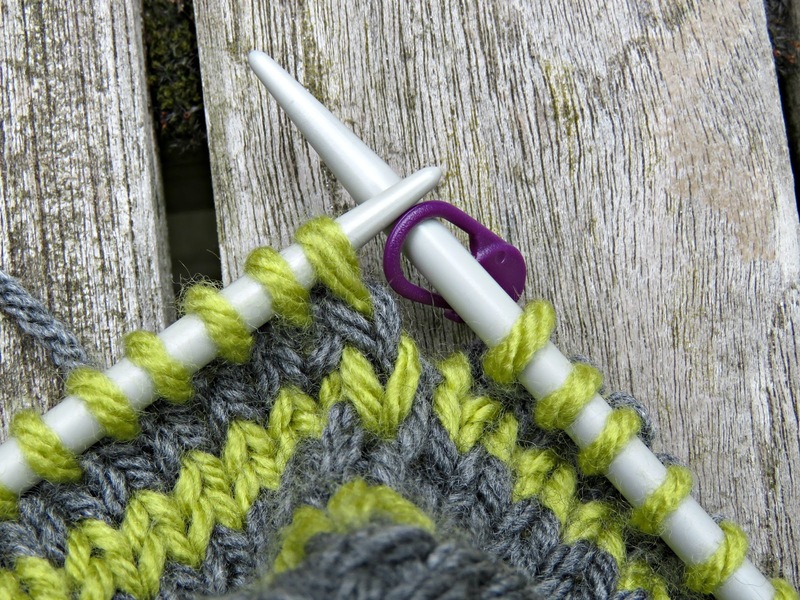 Start the new (stripe) colour, and knit the first row with the new colour, using a stitch marker to flag up the end of the row. 2. At the beginning of the second round insert the right hand needle into the middle of the stitch immediately below the first stitch of what will become the second row. 3. Lift the stitch below the first stitch on the left needle and slip it onto the left needle beside the first stitch. 4. Knit both of these stitches (i.e. first stitch and lifted stitch immediately below it) together. 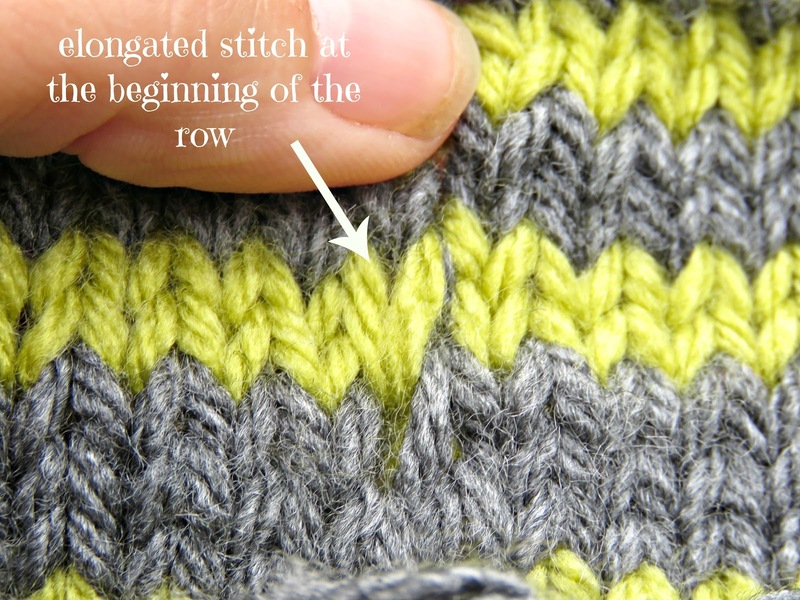 This creates an elongated stitch, which disguises the beginning of each row. It's still not a totally perfect solution in that there will be a line of elongated stitches along the length of the work marking the beginning of the rows, but it's a fix-up that's hard to spot. And if you really wanted to take your stripes to the next level you could stagger the colour changeovers by moving your new row marker one stitch to the left, and knitting an extra stitch on each row, which will produce an invisible join that will move diagonally along the work. In addition it's a good idea to try and position these join lines in places where they're going to be less conspicuous. If, for example, you're picking up stitches to knit a sleeve in the round, it's a good idea to join your first row at what will be the armpit. That way any stitch anomalies will be hidden on the underside of the sleeve, and will be less noticeable. 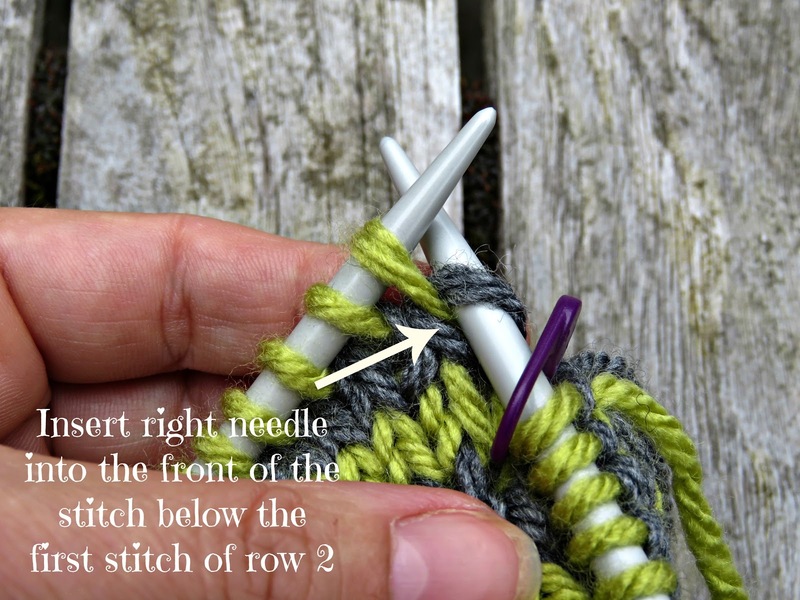 Alternatively if you're knitting the body of a jumper, position the new rows so that they start under the armpit as well. This way they'll be running down the side under the arm in a less noticeable position. All the best and happy knitting! Great post, Bonny! Thank you!